Rohit finished on a majestic 100* off 56 balls to help India chase down England's mammoth target of 199 with 8 balls to spare. 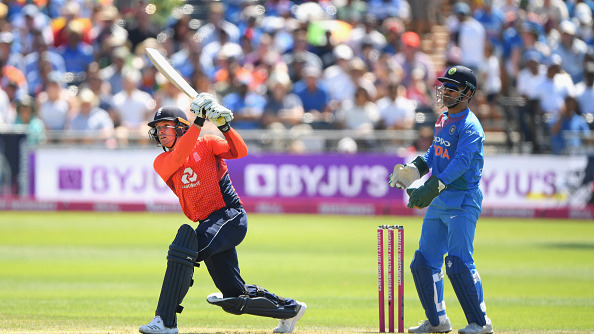 England and India faced off in the third and final T20I at the County Ground, Bristol on Sunday (July 8). It was a series decider tie as both the teams had won one match each in the first two encounters. India skipper Virat Kohli won the toss and opted to bowl first. England got off to a flier with Jason Roy and Jos Buttler adding 94 runs for the opening wicket. Despite the brilliant start, the hosts faltered in the middle overs as Hardik Pandya claimed 4 for 38 in his 4 overs. Alex Hales (30 runs off 24 balls), Eoin Morgan (6 runs), Ben Stokes (14 runs off 10 balls) and Jonny Bairstow (25 runs off 14 balls) were Pandya’s victims. The pair of Liam Plunkett and Adil Rashid added 7 runs in the final over to help England post an imposing total of 198/9 in 20 overs. India needed a solid platform upfront to chase down this target. However, they didn’t get one as David Willey removed Shikhar Dhawan for just 5. The centurion of first T20I, KL Rahul (19 runs of 10 balls) didn’t make it count after getting the start. The visitors were in a spot of bother at 62/2 when skipper Virat Kohli joined the vice-captain Rohit in the crease. The duo of Rohit and Kohli then put on a batting exhibition and forged a 89-run partnership to put India on top. Chris Jordan got rid of Virat (43 runs off 29 balls) in the 15th over which brought in Hardik Pandya to the crease. On the other hand, Sharma continued the carnage to notch up his third ton in Twenty20 Internationals. With this innings, Rohit also became the first Indian and second batsman in the history of T20I cricket to score three centuries in the shortest format. Only New Zealand opener Colin Munro has accomplished this feat. 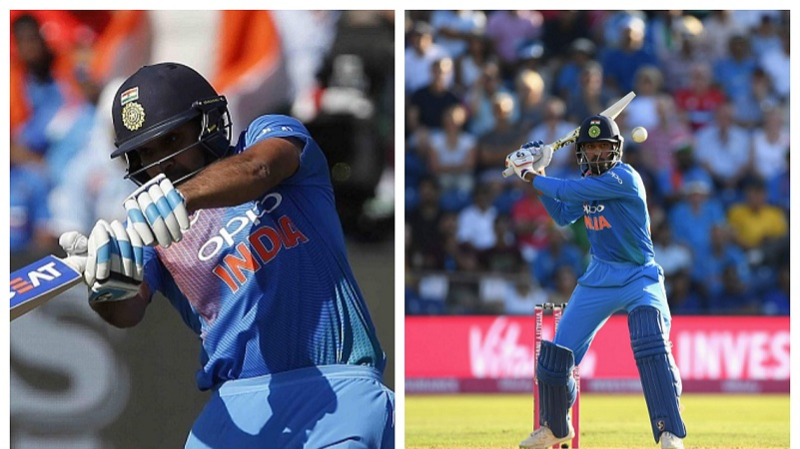 Rohit finished on a majestic 100* off 56 balls (11 fours and 5 sixes) while Pandya remained unbeaten on 33 off 14 balls as India won the match by 7 wickets and 8 balls to spare. By virtue of this victory, the Men in Blue also clinched the three-match T20I series 2-1. Twitterati were in awe to see the way Rohit Sharma made the mockery of England attack to chase down this intimidating target. Well then ... Let’s get back to admiring @BCCI and @ImRo45 ??? ?#EngvInd Congratulations !!! Roooooooohiiiitttttttt shaaarrrrmaaaaaaaa u beauty @ImRo45 top ???? brother.. great stuff with the bowl and bat @hardikpandya7 #ENGvsIND congratulations team india ???????? @BCCI Indian summer in England ???????? Talent abhi Zinda hai. @ImRo45 , what elegance and clean hitting. 3rd T20I 100, many more to come. Great effort from Kungfu Pandya with both bat and ball. Well deserved series win. India has become a seriously good limited overs team, no matter where they are playing in the world. Such clean hitting by @ImRo45!! Pakistan beats Australia in a thriller & now in decider Hindustan beats England ???????????????????????????? comprehensively that goes to shows that subcontinent teams are so well equipped in shorter format .. But outstanding innings by Rohat Sharma..